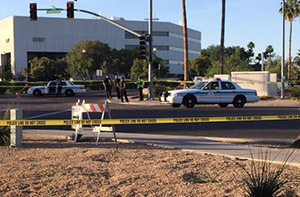 Glendale, Arizona—Brandon Montemayor, age 24, died Wednesday after being struck by a vehicle as he was crossing a street at the intersection of Thunderbird Road and 57th Drive. Mr. Montemayor was in a crosswalk when he was hit. Glendale Police accident investigators report that the driver who struck Mr. Montemayor left the scene. Police urge anyone with information about this tragic incident to call 623-930-3000 or Silent Witness at 480-WITNESS. We wish to express our sympathy to Mr. Montemayor’s family and friends at this time of great loss for them.